Heading Keeps the water out! Directions 1. Reach over head and pull up and back on outer ear to straighten ear canal. 2. With opposite hand, grasp earplug stem and insert by pressing forward in a circular motion to form airtight seal. Do not push the earplug so far into the ear that you are unable to easily grasp the stem with the thumb and forefinger for removal. Remove slowly with a twisting motion to gradually break the seal. Do not store wet earplugs in case. Make sure case and earplugs are dry before storing. Tips: If you are having trouble getting the plug to seal, re-insert and wiggle stem while gently pushing plug to form an airtight seal. If you are having trouble inserting the plug into the ear canal, try inserting with the tip pointed slightly forward, toward face. Use looped hinge on carrying case to attach to keychain. Cleaning Instructions: Wash with mild soap and warm water. Dry thoroughly before inserting into ear. 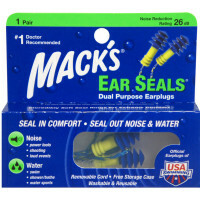 Uses Helps prevent swimmer's ear. Swim, shower, surf, bathe, water sports, etc. Virtually invisible. Made with SuperSeal ultra soft silicone. Warnings Recommended for ages 7 and up. 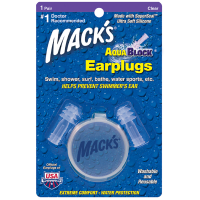 Mack's AquaBlock Earplugs are not recommended for use with ear tubes or by patients recovering from ear surgery unless directed by a doctor. 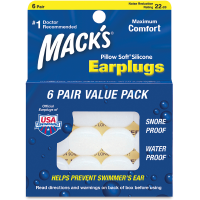 Use Mack's Pillow Soft Silicone Earplugs with ear tubes and for post surgery protection. Do not use for scuba diving or at depths over 10 feet. Use only as directed. Keep away from infants and small children. 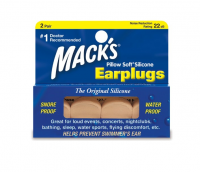 These earplugs are non-toxic, but may interfere with breathing if caught in windpipe, which could lead to serious injury or death.